Staff from Deo Volente Solicitors prepared food parcels for low income families yesterday (Wednesday) to kick start a fundrasier. More than 15 solicitors, trainees and paralegals attended a team briefing at Bedford Foodbank in Murdock Road. For the next five weeks, teams of four led by a partner of the firm will be volunteering at the warehouse, preparing food parcels for families and individuals who cannot afford three meals a day. 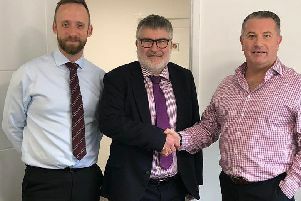 The partnership between Deo Volente Solicitors, Bedford Foodbank and three local organisations including the T&C was launched in January as part of the law firm’s 10th anniversary campaign. On April 20, it will be a decade that the firm has been serving the community in Bedford. Sarah Broughton, project manager for Bedford Foodbank said: “Bedford Foodbank is thrilled and honoured to be chosen as one of Deo Volente Solicitors campaign partners to celebrate their 10 year anniversary. “The foodbank is here for everyone in the town who finds themselves experiencing a crisis and unable to provide food for their household. Deo Volente Solicitors’ business director, Dilly Hussain, said: “We are very excited about getting involved with the great work of Bedford Foodbank.